Keratitis in a horse is often recognized when a bluish-white film begins covering the horse's eye or when the eye becomes cloudy because of the loss in transparency of the cornea. Keratitis is classified according to location in the eye and includes superficial, deep, and ulcerative conditions. Further classification using the cause of the keratitis as a basis, include viral, bacterial, and fungal. Ulcerative keratitis occurs when a corneal injury becomes infected with either a bacterial or viral infection. This condition is accompanied by a purulent discharge and signs that the eye is painful. Fungal keratitis develops when the cornea is injured and becomes contaminated with fungal organisms that are present in the horse's environment, especially in straw bedding and hay. 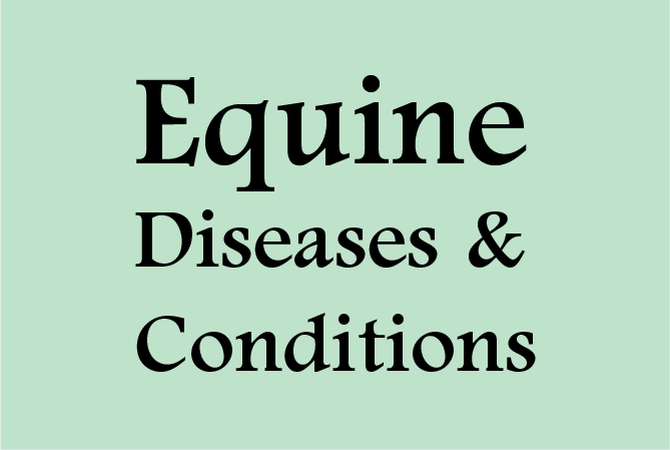 This condition often occurs in horses that have had extended treatments with antibiotics and corticosteroids. Keratitis usually begins with an injury to the cornea that becomes infected, although cases where the disease develops as a secondary response to inner eye inflammation caused by glaucoma or uveitis can also occur. All painful eye conditions should receive immediate veterinarian attention. If any foreign matter is in the eye, it should be flushed out or removed before it causes further damage. Care should be taken to make sure that no eye medications containing corticosteroids are used in an eye suspected of having a corneal injury because of the possibility of a rupture of the cornea. Good horse and environment management to prevent eye injuries can be helpful in reducing the number and severity of corneal injuries that result in keratitis. Corneal scrapings and a microscopic exam will expose active inflammatory cells, bacteria, or fungi. Once the veterinarian has this information, treatment can begin. Mild cases of keratitis are usually treated with antibiotics. Small, surface ulcers respond to topical antibiotic ointment applied four times a day. Deep or infected ulcers will require intensive antibiotic therapy. The eyelids may need to be sutured together to keep the eye clean and from drying out. Veterinarians sometimes prescribe soft contact lenses for this purpose. In some cases, surgery will be necessary to create a flap of conjunctiva to cover the ulcer. White spots or scars on the cornea that are large enough to interfere with vision can be removed by eye surgery after healing has taken place. What Constitutes a First Aid Emergency?